Express Scripts said in May that Anthem, which sued the company last year for allegedly not passing along billions of dollars in savings from negotiated drug prices, will likely not renew its contract come 2019. PBMs, which process drug claims and negotiate drug discounts with pharmaceutical companies on behalf of payers, have been criticized for operating under the veil of nondisclosure agreements and a general lack of transparency throughout the pricing process. "If we do enter into a new contract with Anthem, it would be on terms significantly less favorable to us than our current contract," the company said in Securities and Exchange Commission filings. Express Scripts' network pharmacy revenue decreased $691.2 million on the quarter, or 5%, primarily due to filling more generic prescription claims. However, home delivery and specialty revenue increased $544 million, or 5%, primarily due to ballooning prices on branded drugs and a higher proportion of specialty claims, which have been the drivers of double-digit increases in pharmaceutical spending. The company made a profit of $5.21, including interest, taxes, depreciation and amortization, for every processed claim in the second quarter, up from $5.15 last year. 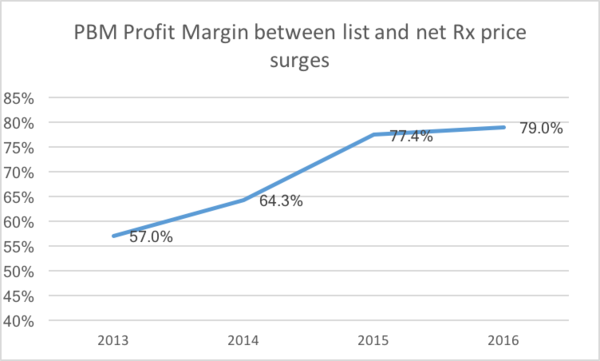 Generally, filling more generic prescriptions reduces PBM revenue, as generics are typically cheaper than branded alternatives. 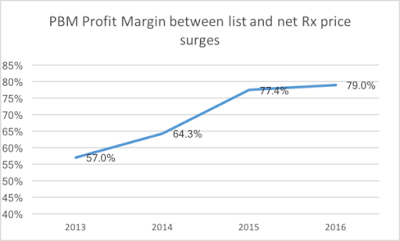 But since ingredient costs paid to pharmacies on generics is lower than the price charged to clients, filling more generic prescriptions bolsters gross profit, the company said in regulatory filings. Tyrone's comment: So Express Scripts admits to spread-taking yet most plan sponsors and their advisers believe themselves to have entered a pass-through services agreement which prevents spreads. The truth is non-fiduciary PBMs have gotten smarter about where to hide these revenues. Analysts expect Express Scripts to benefit from increased use of generics, a shift toward mail orders and significant growth in specialty and branded drugs.